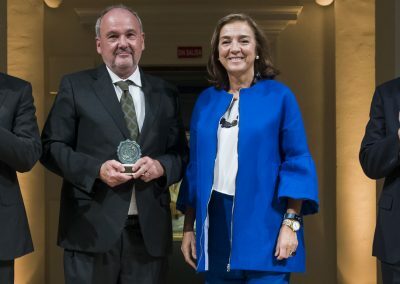 Joan de Solà-Morales (second from left) collects Sanz-Solé’s medal from the hands of State Secretary for Research Carmen Vela. The RSME medal is a prestigious recognition awarded since 2015. Sanz-Solé could not attend the ceremony, held at BBVA Foundation in Madrid, because on that same day she had to participate in a ERC panel deciding on the next Consolidator Grants. But she showed her gratitude to the Society with a video message. “This award encourages me to continue in my efforts to support science in all of its aspects, including mathematical research, youth training, and the participation in international organisations that help citizens advance towards a wiser, thus more critical, open, tolerant and just society,” she said. Together with Sanz-Solé, Antonio Campillo López (University of Valladolid) and Manuel de León Rodríguez (CSIC) also received the reputed distinction. Sanz-Solé’s medal was collected in her name by Joan de Solà-Morales (second from left in the picture). Sanz-Solé has been Professor of Mathematics at the University of Barcelona since 1986 and is a BGSMath Affiliated Professor. 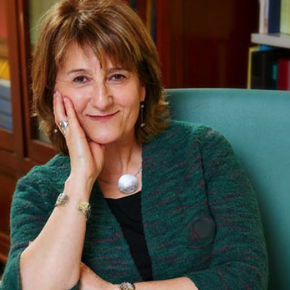 In 2011, she was elected Fellow of the Institute of Mathematical Statistics and in 1998 she was awarded the Narcís Monturiol Medal by Generalitat de Catalunya. Her main scientific contributions are on Malliavin calculus, large deviations and path properties of SPDEs. Since 2015, she is associate editor of The Annals of Probability. In 2017, Sanz-Solé has also been nominated as honorary member of the Catalan Economists Association.